Another scheduled post for you whilst I’m not in the UK. I wanted to show you a few pieces I picked up in Topman the other day where I work, which you have probably already seen on a million other blogs as they seem to have caught on fast, but I’ll show you nonetheless! These were all in the sale at just £1 each which is completely ridiculous for jewellery in my opinion but I’m not complaining! They’re all pretty long, which is what I like at the minute, and you may have seen one or two in previous posts. I’ve even got my eye on some of the clothes that are coming in for Autumn/Winter. Some of their jumpers would be perfect with a little scalloped collar blouse peeping out worn with some skinny jeans. Have you bought anything from a menswear brand before? 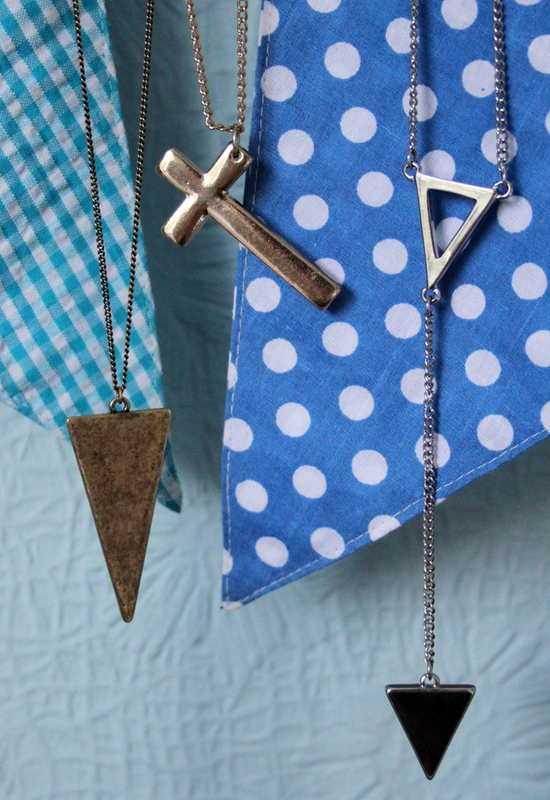 Did you pick up any of these necklaces in the sale? Dont’ forget there is still time to enter my InPink giveaway! I never ever think to pop into Topman yet read so many blogs raving about their jewellery. You picked up some great pieces! They're all gorgeous.. I keep forgetting to go to topman, they're jewellery is always awesome! 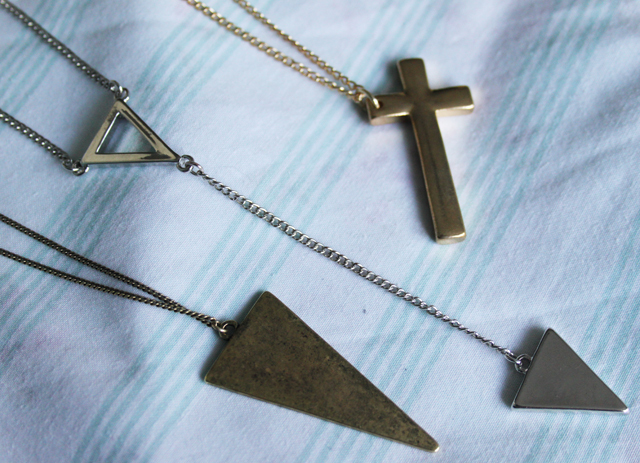 I love the triangle necklaces. Every time I go in Topman with my boyfriend I see their jewellery and wonder why girls jewellery isn't as good. I've always been a fan of menswear. I used to always buy cardigans from the mens section, because they were slouchy & comfy & longer, which is how I wanted them. I don't have to so much now, because more of the womens ones are 'boyfriend fit'. I also buy lots of mens tshirts. I just like the way they fit better! I don't have a Topman near me, so was gutted that I'd missed out on their sale. However when I visited Oxford I thought it was worth a quick look, & ended up getting approx. £65 worth of jewellery, for £7! Couldn't believe it. Didn't see any of the ones you've got there though, I did have an eye out for that double triangle necklace, because I definitely would've snapped that one up (I love it! ), but haven't seen that one in store at all. I bought a beaded bracelet from the Topman sale, gutted I didn't see that triangle necklace though, I love Geo jewellery! I pop into Topman now and again to look at jewellery – especially the rings! But I never thought about looking at the necklaces – what a great idea! I shall be heading to Preston Topman immediately!